Our Story is Our Story – People Drive Change! Companies love to publicize that they are driving social change, but often overlooked is how that change came about. It’s people! After investing hundreds of millions of dollars for large companies driving social change through environmental, social, and governance (“ESG”) investing or socially responsible investing (“SRI”), I had a feeling that companies could do more. But this wouldn’t come from corporate executives at large-cap companies or corporate investing from large pension funds; it would come from customers, from shareholders, from people. I never thought I would find myself in this career. With a chemical engineering degree, I interviewed with companies that were not eco-friendly. Although I enjoyed outdoor activities, the environment and sustainability were the last things on my mind. Then I worked as an environmental engineer. One project gave me firsthand experience on how the decisions people make can change the environment for better or for worse. The project involved the study of pesticides and their impact on the wildlife in the Long Island Sound. After the conclusion of that study I was hooked on promoting the environment, and from there my commitment to ESG/SRI only grew. I’m a father of two and that changed my perspective. Prior to kids, and with a passion for finance, I had two major job goals: (1) become a “Wall Street” banker – Check; and (2) move into the private equity field – Check. It wasn’t until a Father’s Day gift from one of my kids that had me thinking about how my career decisions influenced them. 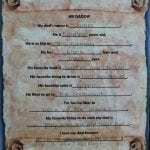 Made at preschool was a “My Daddy” list. 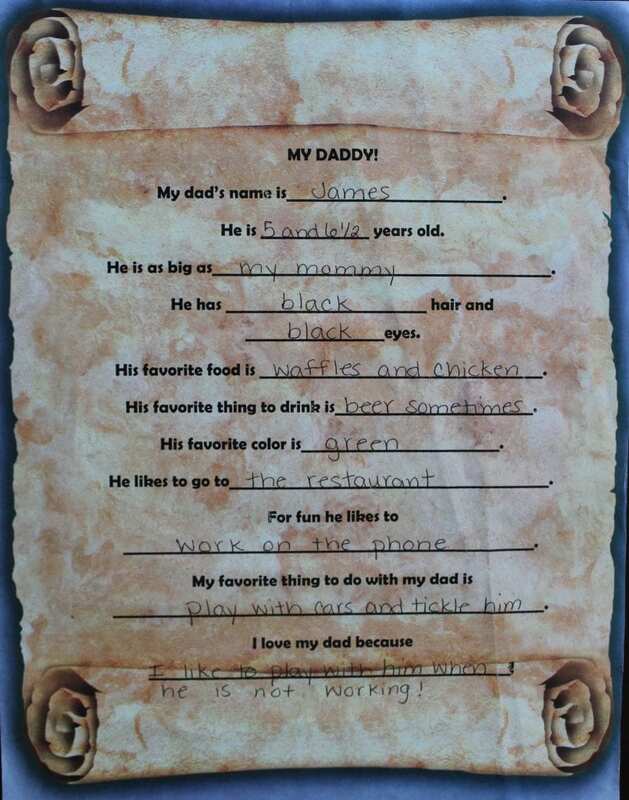 Extremely cute, but also providing perspective, two statements left a huge impression, “For fun, he likes to work on the phone.” and “I love my Dad because I like to play with him when he is not working.” While my kid only sees the amount that I work, it had me think more on the purpose of my work. After working as a banker and investor for numerous years, I wanted my work to serve a greater purpose. I want to leave a sustainable future for my family, my clients, those important to my clients, and society. ESG/SRI. Finance. Family. The gears in my head were turning. My entire career involved working for a variety of companies focused on the environment, sustainability, social infrastructure, and governance. Why couldn’t I do this for myself? Why can’t my clients be individuals, families, small to mid-sized businesses, and non-profits? I can and they Can! And with that I had my solution; create a financial practice to foster my clients’ investment AND sustainability goals. I launched Envest Asset Management with a background in environmental engineering, investment banking in social infrastructure, and debt and equity investing in clean energy. I found that many advisors (independent or brokerages) offering Financial Planning and Investment Management services were missing a third, critical component – ESG/SRI. Independent, fiduciary, fee-only, client obsessive – Envest Asset Management provides financial planning and investment management focused on ESG/SRI investments to individuals, families, businesses, and non-profits. Envest Asset Management and its clients understand grassroots social, environmental, and sustainability advocacy can force significant change, which can be accomplished through investing. Envest Asset Management helps clients make an even greater social impact while preparing for their financial future. Come join me on this journey to Invest for the Future and for the Future Environment. Read more in our Services page. As part of our commitment to ESG/SRI, we utilize ESG practices in our day-to-day operations. We focus on waste reduction through our virtual services, and our third-party service providers are those that also have substantial ESG practices. Envest Asset Management, LLC was formed as a grassroots effort to bring ESG/SRI practices to individuals, families, businesses, and non-profits. This came after a career that spanned from engineering to finance, which included environmental engineering, investment banking in social infrastructure, clean energy project lending, and, most recently, private equity investing in the clean energy space. After working in the private equity space, I had a strong desire to bring ESG/SRI to a different set of investors through the financial planning and investment management industry. Many of the skills used as a private investor apply to ESG/SRI planning and investment management roles. As a private equity investor, I found ESG/SRI investment opportunities and took a deep-dive into the financial health of the opportunities to determine their long-term value. I often created or helped budget for operating performance and profit and losses and sought ways to maximize investor value. Under Envest Asset Management I can apply these same principals to my clients, their financial plan, and their investment portfolio. I worked on all aspects of ESG/SRI. I look forward to educating clients in the space so that we can all make a positive impact together. Engineering – Environmental: provided environmental site design for properties, aided in the design of various water and wastewater treatment system. Investment Banking – Socially Responsible: member of a team that placed over a billion dollars in debt for social infrastructure projects. Private Equity and Lending – Environmental, Governance, and Socially Responsible: Invested (debt and equity) in clean energy assets throughout the U.S. Many investments were located in rural areas that provided highly skilled jobs. A former member of the Board of Directors and Secretary of the Board for various privately-owned companies. Non-Profit – Environmental, Governance, and Socially Responsible: Board of Directors for two non-profit organizations: the Ridgefield Education Foundation (“REF”) in Ridgefield, CT and Woodcock Nature Center (“WNC”) in Wilton, CT. REF raises capital to promote educational advancements in the Ridgefield Public School (“RPS”) system. WNC connects people to the habitats, plants, and animals of southwestern, CT through programs that build awareness, nurture understanding, and advance conservation. Prior to launching Envest Asset Management, I worked at Energy Power Partners, a clean energy focused private equity fund. While the bulk of my finance career was spent there, I also worked in clean energy project finance lending for TD Securities and TD Bank. My finance career started as an investment banker in social infrastructure at UBS Securities placing municipal bonds for state and local governments and other municipal authorities. However, I cut my teeth in the ESG space when I started my career as an environmental engineer working in Long Island, NY and in upstate NY. Outside of work, I am on the Board of Directors for REF and WNC. You may find me actively chasing my two kids around Ridgefield. Or you may find me running the streets throughout Wilton and Ridgefield as an avid distance runner. I also drive a hybrid vehicle. I hold an MBA from the Simon Business School at the University of Rochester and a BSE in Chemical Engineering from Villanova (Go ‘Nova!). I’ve been engaged as a guest lecturer or panelist at various clean energy related conferences.